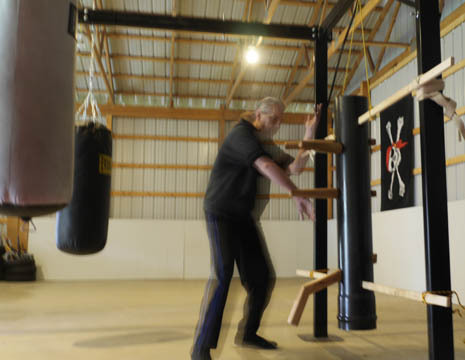 The wooden dummy, or Mook Jong, is the most visually characteristic piece of training equipment in Wing Chun Kung Fu. Though other gear such as sand bags and the rattan or iron hoop are also used in developing the art, the Mook Jong is the King of all the training devices! There are 2 major types of dummies you will encounter, "dead" and "alive". The former is typically a post in the ground with arms, it does not move or have any give when struck. Conversely, the later is mounted on thin slats so it can rebound, rock, and shift side to side in response to the various movements. Because of this the alive dummy gives much more of the feeling of working with an opponent. The one pictured here was made by my longtime friend and student, Mr. David Haugh. He used plans from the Internet for the traditional body design and was able to make perfect arms for it by lathing down some hardwood table legs. 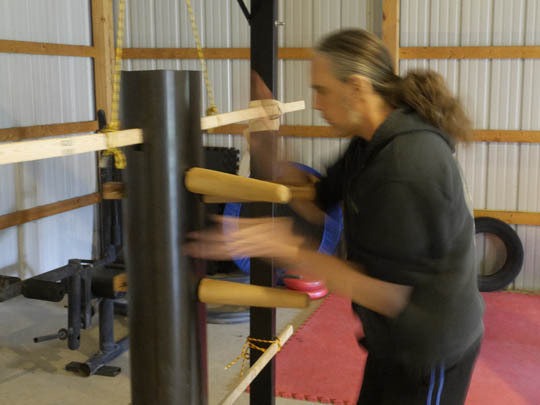 Out of all the classical forms in Wing Chun the wooden dummy set is the one I most enjoy practicing. The 3 open hands forms have their own charm but the dummy just never seems to get old! While I've long since forgotten nearly all the forms from over the years in Kempo, Praying Mantis, etc. the wooden dummy set still has a special place in my heart. It most �feels� like Kung Fu, like you are in a timeless connection to the ancestors of the art as you go through the movements. Like all things Wing Chun, there are many different ways people do the form. I learned the set the way Sam Kwok shows it here in this excellent video clip. Why did I focus on that version of the form over another? Because it looks like what Ip Man left us with, as seen below. Plus I know his versions of the open hand forms so what sense would it make to learn one school's open hand forms but another school's dummy set? Regardless of which lineage of Wing Chun you're into, and I think they all have things to offer, you should learn the form your teacher's way and get it down solidly. Then later when you look at a different version of the form you'll recognize the key motions and be able to adapt them to your own free practice on the dummy. For example, in looking at the Pan Nam lineage dummy form there are several motions not done in the Ip Man version. By knowing the later it made seeing this and adapting them into free flow quite easy. Because the dummy is quite hard one must be cautious when striking it. It isn't like hitting a heavy bag! Throw one good punch on the wooden body of the dummy and you won't want to punch it again. Start by just tapping the dummy, learning the correct weapons of the hand and progressively conditioning the palm and edge of hand blows. The power used is different than in Boxing, Kickboxing, or most Hard Style Martial Arts. That is long power, this is short power. You will injure yourself if you train on the wooden dummy in that manner. Instead here you learn to emit a pulse of energy using your whole body with the goal being to jolt the dummy from very short range. These jolts can range from contact distance to roughly the length of the dummy's arms but are usually done from about 3� to 6� away. In the photo above you see the hands as the pulse is happening, hence the blur.